Summer 2016 in Berlin began as language enthusiasts converged from far and wide for the third Polyglot Gathering. The sun was out, the temperature rose, the lilac bloomed. A bright yellow budget hostel in the Lehrterstrasse became once again, for four heady days, the pop-up capital of world language learning. I attended talks and workshops, practised my languages, drank my fair share of coffee and exchanged news and thoughts with some of the three hundred or so participants. Some were familiar faces, others were there for the first time. I returned to a (then) sweltering London high on ideas and inspiration. After a bit of a delay (thanks to my Russian exams….) let’s spring open my bulging suitcase and unpack some goodies together. How to learn: method in the madness? On the first morning Adriano Murelli spoke to us in German on “Intercomprehension: you know more than you know”. It was all about deploying your existing knowledge to unlock a new language, particularly in its written form. If we understand a language’s writing system, we can work out much of the meaning of words and structures. In the gaps that are left, we can try various alternatives. As Murelli said, he has students who jump to the conclusion that they “can’t understand anything” when they come across even one word they can’t fathom. I recognise the “throw up your hands in panic” response well when I’m faced with a difficult legal problem at work or a technical challenge on the blog. Success in learning is often all about getting over your reluctance to have a go, coping with uncertainty and ambiguity and taking calculated risks. In a confident debut as a speaker Kris Broholm presented wisdom distilled from hosting accomplished language learners in over one hundred episodes of his popular Actual Fluency podcast. There was no one “secret” to success but he fired off a salvo of bullet points, all truths worth repeating: hard work beats talent, immersion alone does not produce fluency, language learning is simple but it isn’t easy….and – here’s that intercomprehension point again – guessers are better learners. Learning another language is a long, hard process, requiring a lot of dedication, said Alex Rawlings in “Understanding the need principle” and the simple “desire” to speak another language is unlikely to carry you through. After all, as an adult trying to learn a new language it’s all about “overcoming human nature”. You need, erm, “need”: you’re either surrounded by the language, you know somebody who speaks it, you have an unusual interest in the country or culture or the language will benefit you at work. You can, of course, set your life up so that such motivations are there, but there they need to be if you’re in for the long term. Not that there’s anything wrong with getting a taste first. The multilingual Richard Simcott has far more “poly” to his “glot” than most of us but even he thought one of his own main strengths was knowing when to stop. It’s fine to go into a project with limited goals. Don’t succumb to pressure (“I must get to advanced level before Christmas”) or put yourself down. Simcott put his Arabic studies aside when his career plans changed and he was no longer going need it. Last summer he did a course in Latvian to get a taste of the language and was happy to leave it at that, at least for now. Duck now! Here come three more of Broholm’s bullets, right on cue: “why is important”, “stay regular”, “it’s a marathon not a sprint”…. One way of keeping going over the long term is to work with others. Kerstin Cable‘s talk “What you need to know before spending money on language learning” was full of tips on working with a teacher. “Spending money….”, she said, should be regarded as “a commitment not a guarantee”. Take responsibility for your learning yourself and know what you want. That may be active tutoring, conversation practice, explanations of particular points. What it cannot be is to have the teacher learn the language for you. “Practice sessions” are really what I’ve been using teachers extensively for in my advanced German and Russian projects and how to work with a teacher was one part of my own talk, “Ever onward! How to improve your advanced language skills”. I really enjoyed preparing it. It was well attended and I had some great feedback and made some new connections afterwards. That’s what it’s all about! 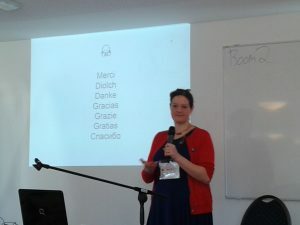 Lýdia Machová gave an inspirational talk on language mentoring (“Don’t teach me, make me learn!”). She’s been running group mentoring sessions for undergraduates, not all of whom begin as highly motivated natural linguists. Like Kerstin Cable, she stressed the importance of taking responsibility for your own language learning. Both Machová and Cable also emphasised the usefulness of logging, so I’m glad my earlier article on this seems to be on the money. For Machová, language learning success rests on four pillars: fun (as far as possible, use materials about things that are of interest to you and in a medium you enjoy in your own language), quantity (a lot of effective, active study), frequency (a little each day), system (a plan – what you want to achieve and how to get there, with accountability to and support from the group and the mentor). Or, as Kris Broholm would say (and indeed said – bullet number 19): “Get help!”. On-line learning emerged as a big theme and it was fitting that iTalki.com were among the Gathering’s sponsors. I’ve mentioned before how much I use the site to find and book tutors (German, Basque and Russian so far) and it was great to meet some representatives of the firm. In this electronic age, it would still be premature to announce that dead trees books are, erm, dead. As last year, there was a well-attended book evening and it great to see some Gathering regulars such as Sylvain Lelarge and Jimmy Mello, as well as Gathering founder Judith Meyer, presenting their own books. The French publisher Assimil, whose books I use regularly, had a stand again this year too. In one of the final talks of the Gathering Benny Lewis announced his own new book project with forthcoming volumes for beginners for French, Italian, German and Spanish (published by Teach Yourself). It’s all about his motivating “speak from day one” approach to “language hacking”. There will be a link-up with italki. Olly Richards of Iwillteachyoualanguage.com gave a talk which was of particular interest to those of us who blog on language learning: “The science of successful blogging”. Not only has he found blogging a welcome creative outlet, but the act of writing has helped him to make him “a better thinker”. Success comes to those who understand their audience and serve it consistently. This year, as usual, there seemed to be a lot of polyglot musicians in attendance. One of their number, Fiel Sahir, took to the podium with a talk entitled “Stealing from musicians: how musician techniques can improve language learning”: whether or not the musician’s and language learner’s “ear” is the same, important points carry across to the two skills of learning an instrument and a language: train the ear, expect the process to take a long time but “keep practising, it will come” and “climb the mountain one step at a time”. Musical gifts very much on show in the end of Gathering concert, with quite a few Gathering participants performing songs performed in one languages or several. Simon Ager sang a song he had written about this way shepherds in the far north west of England (Cumbria) used to count their sheep. They still used the method into the early twentieth century but the numbers are derived from the Old Brythonic language spoken in the area till maybe the twelfth century and closely related to old Welsh. If you can count in Welsh you’d notice some similarities. The first talk I heard this year was Timothy McKeon’s “Creole Languages: from Macau to Curaçao”. A pidgin is a simplified mixture of languages developed when two or more groups with no common language need to communicate. When this is then learnt naturally as a native language by little children, they fill in the gaps to produce a “creole” – a new, stable natural language. McKeon focussed on Spanish and Portuguese creoles such as Papiamento (derived from African languages and Portuguese) and the critically endangered Macanese Patois (derived from Portuguese with Malay, Cantonese and Sinhalese) and talked about the “persistent stigmatisation and misconceptions” around the languages and their speakers. In “Romani the Hidden Gem of European Languages”, Daniel Krasa showed how historical linguistics can be like archeological research. Romani has Persian loan words, but none of them are from among the many Persian words of Arabic origin. Ergo: the Romani migration through Persia towards Europe must have taken place before Islam had taken firm root in Persian culture. Armenian influences suggest they moved through Turkey when Armenian was the main language there. “It’s more fun in the Philippines” is a advertising slogan from that country’s tourist board and Niccoh Sioco took as the title for his overview (first half in French, second in English) of the Philippine linguistic landscape. There are over 150 languages, of diverse linguistic groups. Tagalog (Filipino) is (with English) the lingua franca. It has many Spanish and English loanwords. There are many Philippino immigrants in North America and Western Europe and, Niccoh said “it really touches them deeply” if you have a go at speaking Tagalog with them. Brian Loo’s talk entitled “Introduction to Musqueam” about this highly endangered language indigenous to the area around Vancouver included tidbits such as that it has “suppletive lexical pairs” (some verbs can only be used for a singular object, if you do something to more than one, you need a different verb). The language also has what the phonologists call the lateral fricative (International Phonetic Alphabet [ł]) and what I call the Welsh “ll” – yay!). Noun articles are not definite or indefinite like in English or French, the key distinction is whether objects are visible to the speaker or not (!). Describing the language he uttered a priceless line: “if you speak Hawaiian you will see some similarities.” Only at the Polyglot Gathering! Last year I was kicking myself for accidentally missing Lýdia Machová’s translation workshop. I’m glad to say that she put it on again this year. It was great fun, involving exercises designed to get us to active our vocabulary, to teach us to listen to two things at once (for simultaneous interpreting) and to have a go a note taking (for consecutive interpreting). I ran my own workshop this year with Simon Ager – a Welsh taster session. Rather than making it into just another lecture (I spoke about Welsh at the first Gathering two years ago) we tried to make it as interactive as possible, taking a really communicative approach. In retrospect, I had too many moving parts at some points. Introducing one new idea at a time is quite enough. Still, the room was full and people seemed to enjoy themselves. My other minority language is Basque and I found a couple of other learners this year. Miro was feeling a bit discouraged, having not heard much Basque on a recent trip to Bilbao. I had requests for information about materials on Basque and Welsh and I have some post in the pipelines on just this sort of thing. Drawing on the behaviour of the FB posters Ellen took a humorous look at some of the “types” who range from the “happyglot” (green language learner in the initial euphoric phase), the “polyrot” (for every language that goes in one ear, two fall out the other), the precocious “polytot” (only 10 and already speaks 50 languages and counting). There were also close-to-the-bone asides, such as noting the tendency of some polyglots (men in particular) to exaggerate their linguistic achievements (surely not?) and a warning not to starry-eyed about new technology as against trusted learning methods. Ellen also had the absolute best slide of the Gathering (and I say this from an obvious position of strict neutrality on the issue). Have you all got that? Just to be clear, apply German literalism and remember that Americans don’t do irony. Read, learn and inwardly digest, and look out for my upcoming post on resources for beginners Welsh. Another type of polyglot is the “Hyperglot”, which was the title of the short film which Michael Levi Harris wrote and starred in and which was shown at last year’s Polyglot Gathering (and at the Polyglot Conference in NYC). This year in Berlin, Harris talked about “The Stagecraft of multilingualism”. He had us in hoots of laughter as he read a Yiddish poem with “German body language” and then switched into the accent of an old man from Miami beach. He does a mean Yorkshire accent too (I know, because I grew up there). At one point, we were waiving our arms in the air (“there’s no right way of raising your arm”). But there was serious advice here too: to speak a foreign language successfully you must build yourself a character in it, just as an actor would in a new role. Mimic the sounds of the language (even if you’re just speaking gobbledygook at the beginning). Check out clips of stereotypical Italians, Chinese or Ruritanians on Youtube and study the body language, especially facial expression and lip movements. Be bold. Use broad strokes at the beginning. You can tune your role later. Each evening, as in previous years, events were organised. The International Culinary Festival, the quiz night, a concert by JoMo in the Slaughterhouse Club near the hotel and that final night’s concert when anyone could have a go. French fancies at the International culinary evening. As usual, there was also a the “official” photo, taken looking down on the group from a window at the top of the hotel. This time participants over forty gathered for their own impromptu photo. As a residential venue, the A&O Hostel/Hotel has its plusses and minuses. Among the latter we can count some officious staff (I’m thinking of you, Herr Hausmeister) and pathetic wi-fi. Sort it, A&O, or your business is likely to suffer. I noticed this year that more people were peeling off to eat in groups, elsewhere. But I wouldn’t want to get too cliquey and I make a point of eating at the venue and sitting for some of the meals next to somebody I don’t already know. True, the ability to converse is made difficult to by the noise levels in the dining hall (the acoustics are terrible) but, if the worst comes to the worst, you can always text the person across the table and count it as writing practice in your target lingo. Petty gripes aside, I remain a fan of the venue. It offers a range of good value accommodation, there’s loads of chance to mingle, the event rooms are good. This year the coffee at the reception bar was much improved too. Long may we gather there! With a packed 4-day programme, from nine in the morning to six in the evening and with events running simultaneously in three rooms, you can’t attend everything. I had to miss a lot of talks because of clashing, including several covering aspects of languages and computers, which is another recurrent them at the Gathering. Still, most of the talks are recorded and will be posted later on the Gathering’s youtube channel (be patient as this may take many months – it’s a labour of love from volunteers). I took this photo, and then I flicked the camera to video to take it once more. Yes….you have now been warned…..there is a Howtogetfluent Polyglot Gathering vlog (or two) in the pipelines. Stay tuned!